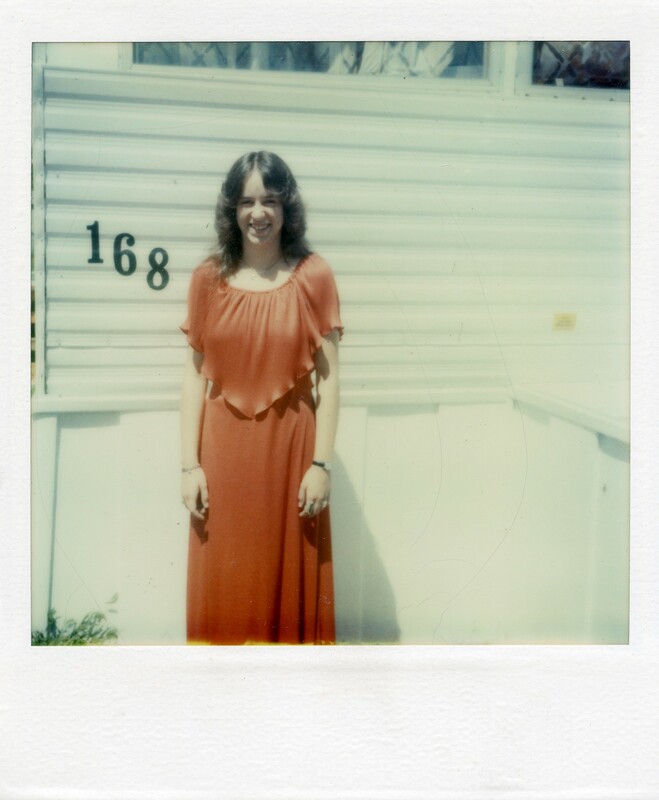 The dress is red chiffon, well– polyester but in Seventeen magazine they say chiffon and I’m calling it that. I tried on so many dresses at Donaldson’s the sales lady said if I wasn’t planning on at least doing layaway I could just go on and head home because she was covering both teen dresses and women’s hosiery and didn’t have time to sit and watch me watch myself in the three way mirror. Senior prom is only once and he did not put one dent in my excitement. Mom’s having one of her lie-downs so I go outside with Gran for a picture and the sky is so blue my heart aches such that I have to say so out loud. My sister Emmy says that ache is from having one foot in the now and another in what’s coming next. But what’s coming is only me going to pick up Randall because he’s only a sophomore and doesn’t drive and it’s on account of our Mom’s being friends that we are even going together at all. It’s hard to mourn someone that isn’t dead yet. So when I see this photo, I feel a strange mix, of well. Everything. She died to me seven years ago, but her body is still wandering this earth. This was taken after she had Sonya and Ricky. She might only be twenty-four here. Me? I came later, when she was thirty-four and somewhat more responsible. But not by much. This picture, this is how I remember her. Bright, youthful, optimistic, and alone. Always alone. This picture was next to the others in the red photo album I treasured growing up, there was one with her holding Sonya and Ricky when they were toddlers, above that was a seventeen-year old Sonya standing next to a Ronald McDonald statue, and next to that was a ten year old Ricky in his football uniform. Kids, they were only kids. Even her, she was only a child when she had them. Barely seventeen when she got pregnant with Sonya then married after high school to Rick Senior in order to provide and be taken care of. Then pregnant again with Ricky. She was always happy on the outside, she would flash a shy smile to strangers and always crack a clever joke in a room. But this smile, I only saw this when she was hiding something. It was when she was being polite, and didn’t want to say what she really thought, or she’d flash it to a man she’d taken an interest in. I never saw this smile, so this photo says a lot. Because maybe she was really happy here. Rarely did I see her happy, she was always so sad. Or angry at life. A life she didn’t choose, but didn’t try to change either. I often wonder who took this picture of my mom when she was, oh say, twenty-four. Because that person must have been very special to see her really smile. When you had me pose in front of our new house, I was happy and alive. Number one six eight, one hundred and sixty eight. The black numbers stood behind me attached as proudly as I to the corrugated white metal. The sun shone brightly that day and I squinted at the camera, at you, in my pale red dress. Those numbers haunt me now. 168 more than half a year, longer than unemployment checks roll in, more than a monthly mortgage payment, but less than a lifetime. When we were first together, all I wanted to do was lie in bed with you. Later, after several years in the house, we scrambled to wake the children up for school on time. You went to work with a tie draped over you like a lei. I stayed behind pounding away at the keyboard, hoping for jobs to manifest in front of me. One day, he came to the door. I didn’t recognize him, not at first. We stood with the screen door between us. He looked me up and down. I remembered then that I had not changed out of my pajamas. I stood my ground in front of this stranger. I thought about you, about all the days you scooted out the door in your suit and hanging tie, always doing your best to get the children to school. I hadn’t known we were playing a game of charades. “You have until the end of the day to pack,” he said, looking me in the eye. This was the most important piece of information he needed to convey. Time, his time, my time, the house’s time, all of us would expire at the stroke of dusk. I wanted him to turn away, to disappear, but all he did was stand, staring.